Does anyone know if a Pi can handle or play 4player Warlords via mame? It would be kind of expensive including a new cocktail wg flat panel along with 4 retro spinners....so it wouldn't be a good "fail" project. Nothing better than a 4 player melee...if you think Gauntlet is the definition of 4 player fun...try warlords. As far as I know Warlords had potentiometers, not spinners. So that would be the same as two analog joysticks when it comes to input. You are correct, Matsadona. Warlords used potentiometers. Warlords also works fine in MAME with spinners, but at ~$70 each, that gets very expensive. 1. Use long-life Honeywell/Clarostat RV4 series potentiometers with an analog encoder. - A-pac or KADE miniArcade 2.0 are good encoder choices. - U-HID Nano doesn't have enough inputs. - U-HID would work, but is far more expensive. - You can assign the player and admin buttons to gamepad buttons. - Opti-Wiz (2 ea.) or StefanBurger's Illuminated Spinner firmware for Arduino (2 ea.) are good optical encoder choices. - The potential difficulty with the rotary encoders linked above is mounting them -- I have a few ideas that might be helpful. - You will also need a separate encoder for the player and admin buttons. Cossackwarrior on klov sells the original 5k pots with the clutch that warlords used. Pricey though. I am going to try out a turbo twist spinner i have laying around, with retropie first to see how much lag is felt. So . . . you want to hang a 4 player control panel . . . off a cabaret with a 13 inch CRT? 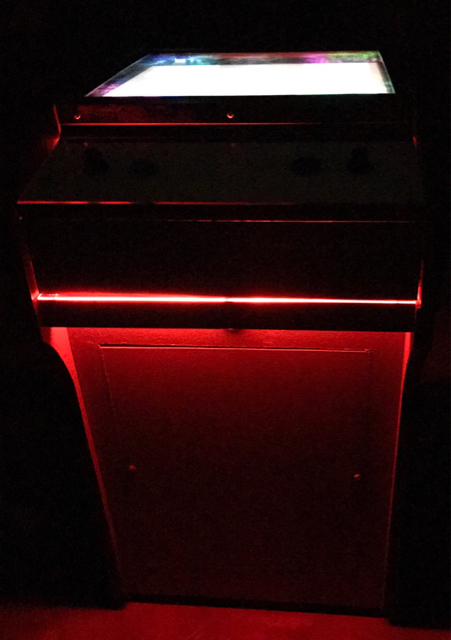 You could make a well-proportioned 4 player cocktail with a 13" CRT, but you may want to seriously consider using a larger monitor/cabinet for an upright 4 player build. This would be a custom cocktail build. Where I am in Iowa and the resources available there is zero chance of obtaining a larger crt monitor. Everyone in the hobby who has a spare monitor will not give one up. So I make due when I come across a trashed cab which is quite unoften. Any update on this topic? Did the pi handle 4 spinners ok? Why not use mice for spinner control? I have been doing it for donkey years. Well I assume a turbo twist or spintrak spinner is emulating a usb mouse. Just looking for more info before committing to build a dedicated warlords cab. Well I assume a turbo twist or spintrak spinner is emulating a usb mouse. Correct. The GGG OptiWiz and Ultimarc optical encoders are USB HID mouse devices. Just looking for more info before committing to build a dedicated warlords cab. Reply #2 above has the basic control/encoder requirements. What further info are you seeking? EDIT: Mark got the spinners working with MAME on a Pi. Info here. What is the purpose of proceeding with spinners for a dedicated Warlords cabinet when it will make the build more complex and expensive? I wouldn't mind using pots but i never used them before. What pot specifically / knobs would work? Using a spinner seemed less complex with a verity of knobs and pretty common. 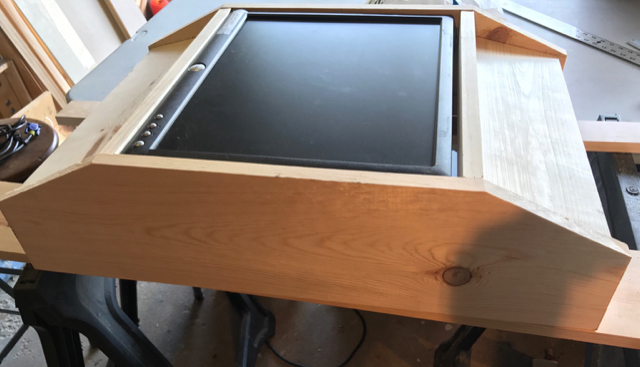 I'm also building the control panel with 3/4" plywood so im not sure how the pot would be mounted. Project update. Pots came in mail. They have hard stops. 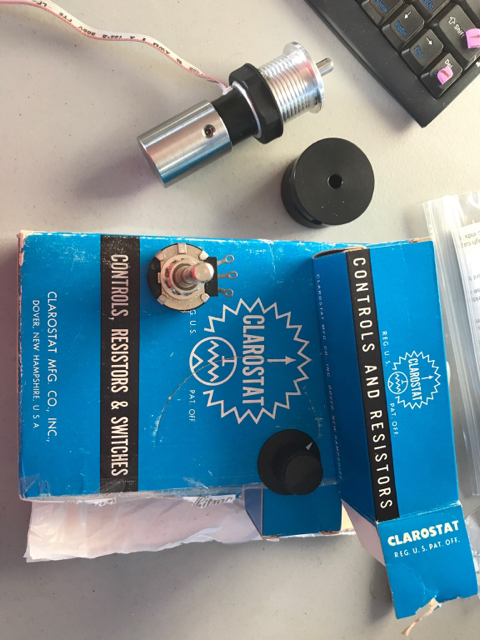 Medical use clarostat 5k with knobs 7.50 apiece shipped. Shaft is long so plenty of space to build a proper mount in a 3/4 panel. A-Pac in mail and hoping it really does make 4 usb mouse inputs for the pots. Here is a turbo twist that does work well in retropie advance mame warlords. I got it from chopper on here. Saw this cocktail on facebook yesterday. Very clean layout and design of the original. Need to look up more google pics. Also, the turbo twist knob does fit on the pot shaft but it is so heavy that might end up destructive to the pot. I seen an ebay listing for something like that. only had 3 left though. what is the label on the back of the pot? 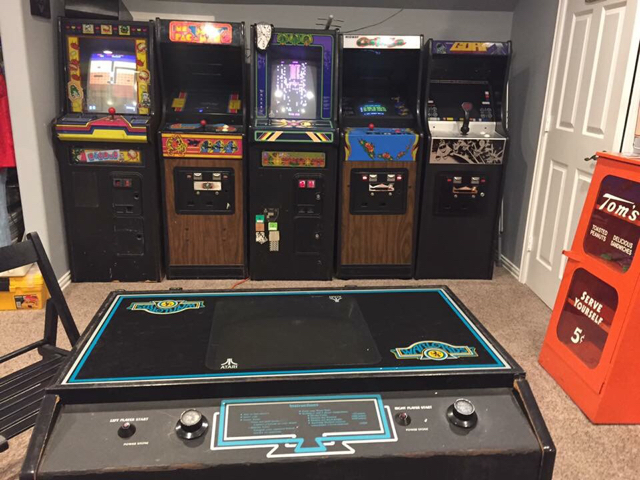 Thanks to big help from Scott the proof of concept for the 4 paddles works in mame from pc with the a-pac and 5k clarostat pots!!!!! For the final Warlords project I'll need to figure out how to fill out the advance mame .rc file so it'll all work in Retropie. How did the pot work for you? I have decided to go with pots instead of spinners for my project as well. The best reason i found to use pots were due to accurately predicting where the paddle will be. So turning clockwise then turning back to the starting position would be on point. When I tried to find the data sheet on your pots it said they were s taper and not linear. Did the speed twisting back at forth feel even to you? with the warlords movement, the player gets to the end of travel before the pots, too so there shouldn't be any wild banging of the stops beyond typical. I was able to get pc/mame to map the pots just fine from the mame/tab gui. Retropie advance mame doesn't allow you to set the analog joystick axis' from the tab gui. UPDATE- I figured out the advmame.rc entries for the paddles so now warlords in pi works with 4 player controls. One of my pots is acting flakey so I'll have to dig into the mechanics of it. They were brand new out of box but look like they'll come apart. Also someone mentioned paddles work in Stella (not lr-stella) so I'll explore that in the future. Having the atari paddle games would be a grand slam! 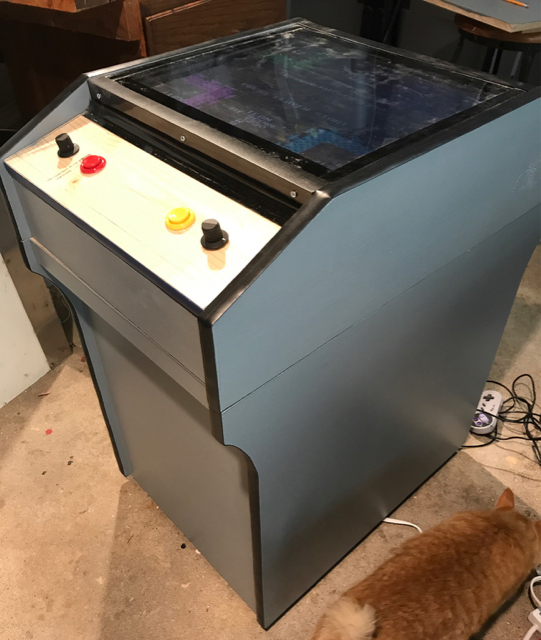 So are you going to build a cocktail cab for this project or are you converting a cab? Roughed in a box by eye balling cocktail pics on google. 18in wide by 27.5in long. Enough space to install a wells gardner cocktail flat panel if the Dell computer monitor has poor viewing angles. Someone mentioned Omega Race. Oh that sounds fun! I would be interested in the viewing angles from each players perspective. I have a vertical cab with a happ vision pro lcd and the viewing angles are pretty cappy. I have this one in my upright mame cab. it is not the cocktail version. I can stand clear across the room from the side and see the screen clearly, without it hazing out. I'm hoping with the Dell computer monitor I can jack up the brightness in the config.txt a bunch and get even more brightness to help with the side angle. Also I think lowering the height of the cocktail might help. All an experiment. Also thinking it would be wise to add a joystick/4 buttons/start-select right in the middle of one side of the panels for handling other games and the menu. Rather than simply leaving a usb snes controller hanging around. Le Chuck used Attract-mode in his SW cabaret and also made a front end skin for SW yoke games in this thread. Got a chance to add the plexi and trim which is just trim from Menard's in bathroom paneling and drop ceiling sections. Sprayed black with plastic friendly paint. Wife was more willing to let it in house as gray furniture rather than black on black so has some robotron effect i guess. Looking great so far! How is your control panel attached? I don't currently have any arcade latches like you can buy from arcadeshop. 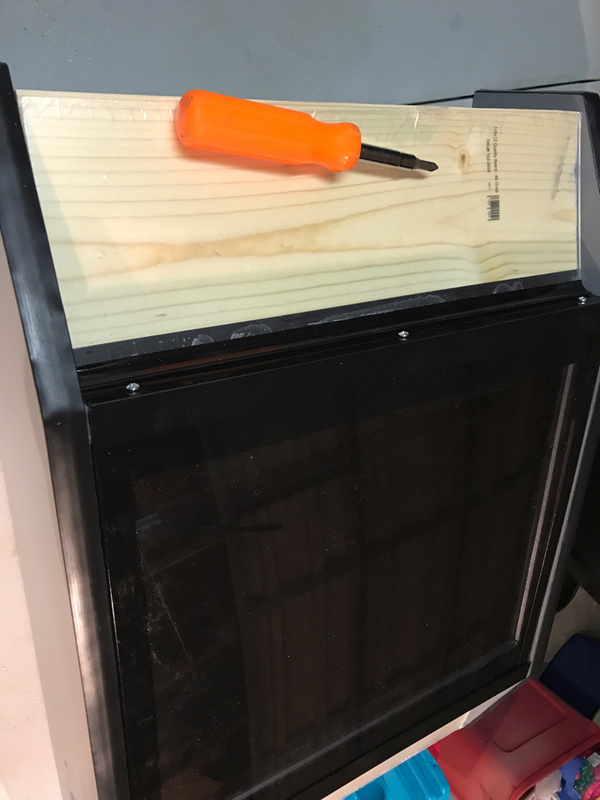 The panel sits on a 1x2 rails screwed to the sides of the cabinet. I counter sunk 1/2in holes in the 1x2 then just screwed into the bottom of the control panel on each side. Got it painted "software" gray last night, wheels added so hopefully sometime today I can get the T-molding added and the top screwed down to the base. Advance MAME won't let me boot directly to Warlords without a weird error, so I'm going to have to switch and see if I can find a warlords romset that will work with lr-mame 2003 then figure out how to get it to setup the joystick axes. 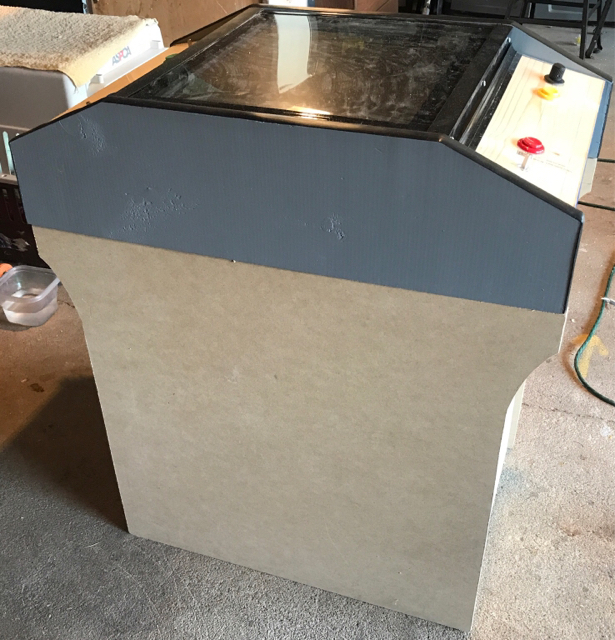 I'm going to try putting a red/yellow projection light inside then have it underglow beneath the control panel, not sure if the idea will work but I'm hoping it makes a cool fire like effect on the cabinet. View angle of dell lcd computer monitor is just fine from standing position. Talked the daughter into a game of it. Plenty of room side by side. She said that is going to be a fun game to play with 4 people. The underlighting seems to work but will have to wait til dark to confirm if it is cool or not. Its inspiring me to stop messing about and crack on with my build, so thank you for that. One thing I've been thinking, is if I can make it Warlords but then 4 player Super Sprint. I'm guessing the pots dont go 360, and you'd need that for SS.. I'm guessing the pots dont go 360, and you'd need that for SS..
To play the 360 degree wheel/spinner games, you might consider using the "rotary encoders with an optical encoder" setup mentioned in option #2 of reply #2 of this thread. Disclaimer: Works easily in newer versions of MAME, but might require some extra configuration to work with the older versions usually used on the RasPi. I still need to do something with my turbo twist spinner so I am pondering another spinner build maybe with a tempest theme? I wonder how pi can handle major havoc, my old laptop has a hard time with it so don't expect much from pi? I wonder how pi can handle major havoc, my old laptop has a hard time with it so don't expect much from pi? It looks OK in using MAME4all. The red halloween projection light from Walmart effect works. UPDATE- Organized the techie details for the setup at retropie.org where I got masterful assistance to help pull off this project. Highly regarded and appreciated help over there. I was reading/researching based on the info you provided for optical encoders, yup. Looks like parts need to be built with 3d printing, but could be a good project for me. Given I am still trying to get my CNC machine to work properly (noisey limit switch, shielding issues), 3D printing feels along way off. Thx for the reply, appreciated. More reading underway on opticals. It seems like we can run two spinners off each of the StefanBurger Arduino? That's an interesting thing you are exploring. 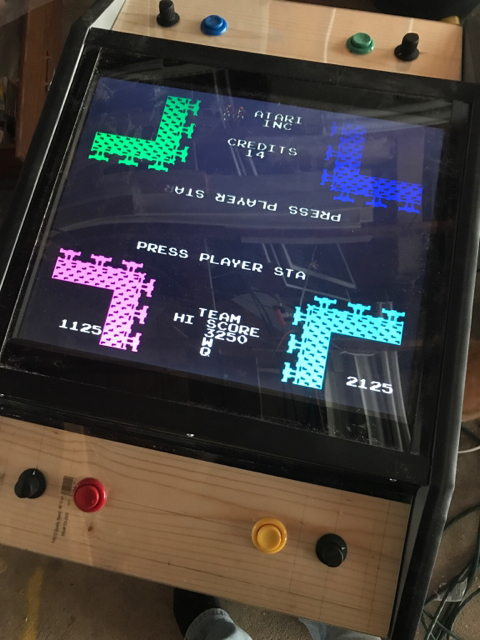 I've been able to get Exidy Circus and Super Breakout to work with advance mame. Haven't found a Breakout or Pong fileset that works with any of the 3 advance mames, yet. Assume that is a no-go. I got Atari Avalanche to fire up and play in advance mame, BUT the paddle won't go clear to each side of the field so you can't catch all the falling rocks. I wonder if the turbo twist spinner can be setup to work with it, instead?